It’s Tuesday and that means designer Radley Raven is about to blast his social media feeds with #TieTuesday, a weekly hashtag that showcases his favorite tie of the moment. The past few weeks have seen a deep blue number as a nod to the Seahawks, an English houndstooth for the depths of winter, and a playful vintage Japanese patterned silk-wool blend. To Raven, his bow ties and corresponding pocket squares conjure up stories about the vintage fabrics and where they were made, sourced, or found. And ultimately it’s about style- being dressed up and put together- even when the look of the day skews casual. Raven’s wares come with tags and labels that specify the limited edition nature of each piece, an estimation of its vintage, a detailed description of the fabric, and a note on origin. 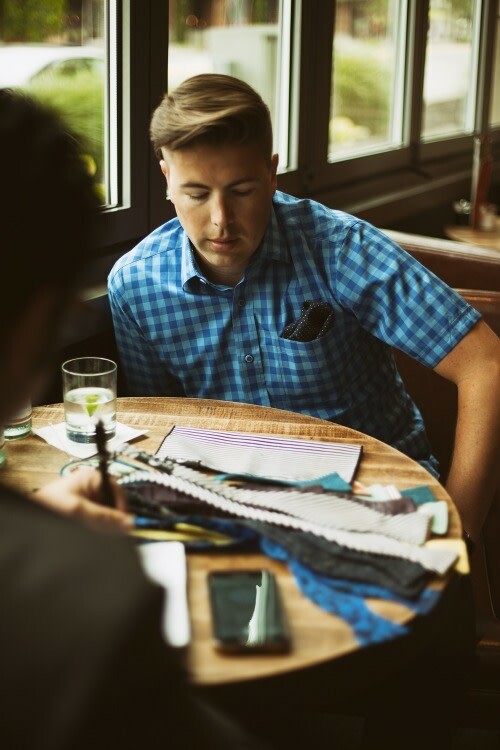 Whether you run into the designer at a fashion popup shop in the Seattle area, find the right pocket square online, or have a last minute sartorial emergency that ends with a face-to-face tradeoff, the neckwear comes with a history and your chance to add to its story. Here’s a look behind the scenes at Radley Raven and his eponymous brand. You describe yourself as tastemaker, collector, and curator. How do those roles influence your work? Raven: Curator first and foremost is a big part of the brand—going out and finding these beautiful, rare fabrics. Without those I don’t think the products would have the allure that they do. Tastemaker is just choosing certain styles or fabrics that I personally like and that will work well given where we’re at in the fashion world. As a collector, the fabrics have such fascinating histories. Maybe it’s a century old fabric found in a grandson’s attic or maybe his grandma was a seamstress. The stories make the fabrics so special to me and to the people that buy my products. A lot of the fabrics that I find in Asia are hand-loomed and hand-woven. That would go way back. In sixth grade I remember designing shoes in class all day. Back then it was always basketball shoes; but today I’d imagine something different, unless you could wear monk straps on the court. What do you do to get yourself into a productive headspace when you’re feeling stuck? I like to take walks or drives, listen to music and forget about everything and enjoy the beauty of where we live. If I’m really stuck I’ll set it aside for the day and wait till late at night and pour a drink to see where it goes. I find that I often get inspired creatively late at night. What are five things that you can’t work without? I’d say coming from the Northwest, coffee comes to mind—it’s a great work starter for me. The vintage fabrics and the people that help me find them around the world. Music always. I have a really talented photographer that I've worked with pretty much since day one, his name is Amir Zahed, and he’s such an important aspect. And depending on the time of day, I’d say either my briefcase full of bow ties and pocket squares, or a nice bourbon. Speaking of your briefcase, where can we find your bow ties and where would you like us to find them in the future? You know, I love doing personal confrontations where I meet clients at their home or office, coffee shop, bar, or wherever. I’ll bring all the bow ties and pocket squares, even fabrics if it’s for a custom project. Of course my website is the most accessible place to get the goods. I also do popup shops in the area periodically. Where is the weirdest place you’ve sold a tie? On an airplane in mid-flight. 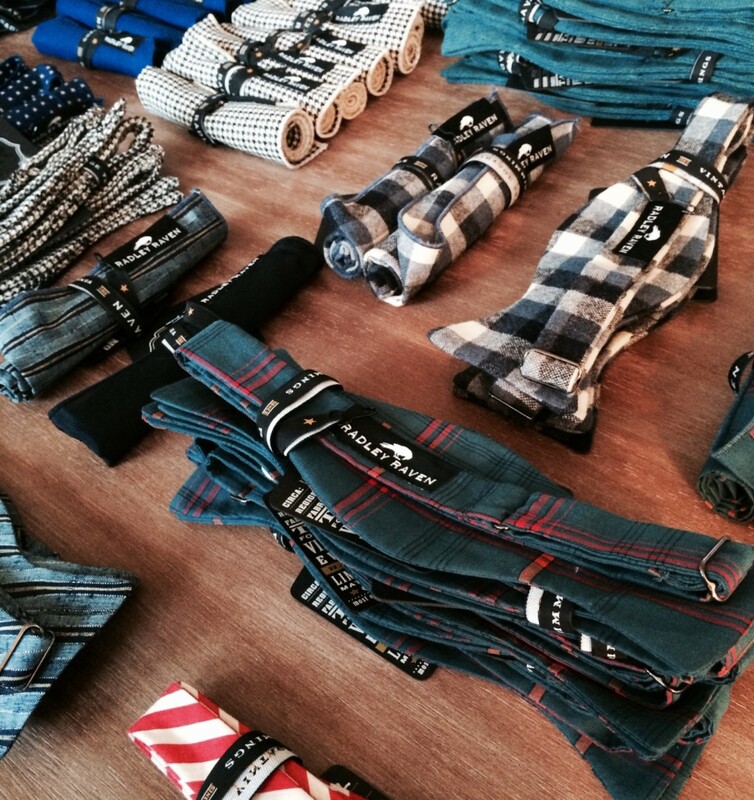 I’m doing regular neckties this spring; the dates haven't been announced yet but will come soon. We'll do a limited-edition first release and then another line for summer. Lastly, bow ties are, in theory, simple to tie but are always still a bit confounding. Any tips to newbies? My first time took me about an hour, maybe longer. I find that a common problem with bow ties, not many people know how to tie them. Luckily Radley Raven put together an instructional stop-motion video to get you over the learning curve.